From the top of Killorglin town, turn left at roundabout down Langford Street for 800m. Follow white line on road around to the right for approx 2.5 miles as far as Caragh Lake School on right (painted pink. Opp this you will see a former shop with P Shea written over door. Turn left at this house and Ard na Sidhe is 1 mile on the right. Please drive carefully after Killorglin as the roads are very pretty but narrow. One of the most intriguingly beautiful areas in Ireland is tucked away off the beaten track around Caragh Lake on the Ring of Kerry. Just south of Killorglin this magnificent lake is four miles long and surrounded by heather hills, forests, and exotic foliage. It is an area that is often missed by the speedy traveller heading south on the Ring of Kerry but for those in the know it is total magic and a wonderful base from which to work out around the South West or just stay put and enjoy the peace and beauty. From here you can see the MacGillicuddy Reeks and the mountains towards Glencar. On one of our many trips to Parknasilla when our boys were young, we stayed at Caragh Lake and next day drove over the mountain on literal goat tracks down to Sneem. It was absolutely magical with mountainy goats literally springing out in front of us on hairpin tracks. In Victorian and Edwardian times the wealthy aristrocrats had homes in the area and the finest of these was undoubtedly Ard na Sidhe Country House. 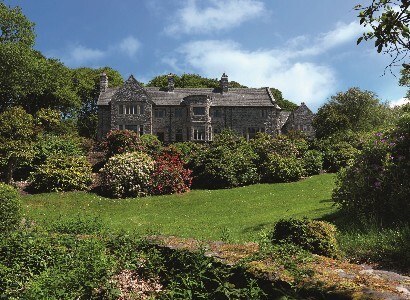 Built by Lady Edith Gordon, a noted gardener, traveler and writer, in 1913, in an era of graciousness and charm before the Great War, Ard na Sidhe, is an extraordinarily beautiful manor house nestling in woodlands right on the shores of Caragh Lake with unrivalled panoramic vistas. Now an absolutely charming 18 bedroom small hotel, a sister hotel to the fabulous Europe Hotel and Dunloe Castle in Killarney, I consider us lucky to be able to stay in such a beautiful place – a place of dreams – to live the life even if only for a brief period. Lady Gordon planted many trees and her spectacular rock garden remains an integral feature of the gardens at Ard na Sidhe. Ard na Sidhe is total luxury in a beautiful understated way with influences of Arts & Crafts Movement, which flourished between 1860 and 1910. Nestled between 32 acres of spectacular gardens, hidden pathways, and secret glades, which give way to the lakes and mountains beyond, there are ten bedrooms in the main house and eight within the courtyard’s Garden House. Crisp Irish linens, deep mattresses, and sleeping to the gentle sounds of the peaceful lakeshore, after a smashing dinner with wonderful wines, is the order of the day. The best of local and seasonal produce is executed and presented with style. Grilled prawns and crab claws in a garlic chilli oil served with a crusty homemade baguette. Kerry Coast smoked salmon is with horseradish caperberry served on homemade brown bread, whilst grilled scallops and confit of duck are served on a salad of Bell Pepper, pink grapefruit and glazed walnuts. When it comes to mains cocoa flavoured medallion of prime Irish beef is served with a Barolo jus, wild mushroom ragout and a potato herb blini. Crepinette of Kerry Lamb with thyme jus comes with sauteed green beans, cherry tomatoes and Bechamel Pecorino potatoes, whilst an innovative Thai omelette of fresh Atlantic Salmon is served with a prawn cream sauce, sauteed spinach and a cauliflower cheese mash. Think then of indulging in maybe goat’s cheese gratinated figs and prunes served with vanilla thyme and grape seed oil, or perhaps a fabulous sea salted chocolate ganache served with Whiskey ice-cream and a Drunken Chocolate Brownie. Round that off with a glass of Port or a Brandy from the drinks cabinet and relax by the open fire in the lounge and a stroll in the magnificent gardens and you will find God is in his Heaven.